We aimed to study the relationship between measures of adiposity, insulin sensitivity and N-terminal pro-B-type natriuretic peptide (NT-proBNP) in the Diabetes Prevention Program (DPP). The DPP is a completed clinical trial. Using stored samples from this resource, we measured BMI, waist circumference (WC), an insulin sensitivity index (ISI; [1/HOMA-IR]) and NT-proBNP at baseline and at 2 years of follow-up in participants randomised to placebo (n = 692), intensive lifestyle intervention (n = 832) or metformin (n = 887). At baseline, log NT-proBNP did not differ between treatment arms and was correlated with baseline log ISI (p < 0.0001) and WC (p = 0.0003) but not with BMI (p = 0.39). After 2 years of treatment, BMI decreased in the lifestyle and metformin groups (both p < 0.0001); WC decreased in all three groups (p < 0.05 for all); and log ISI increased in the lifestyle and metformin groups (both p < 0.001). The change in log NT-proBNP did not differ in the lifestyle or metformin group vs the placebo group (p > 0.05 for both). In regression models, the change in log NT-proBNP was positively associated with the change in log ISI (p < 0.005) in all three study groups after adjusting for changes in BMI and WC, but was not associated with the change in BMI or WC after adjusting for changes in log ISI. 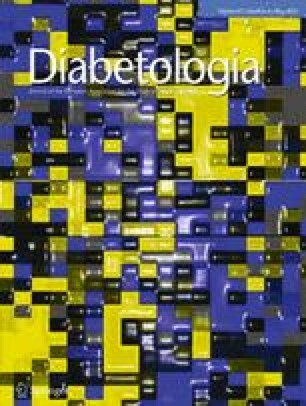 Circulating NT-proBNP was associated with a measure of insulin sensitivity before and during preventive interventions for type 2 diabetes in the DPP. This relationship persisted after adjustment for measures of adiposity and was consistent regardless of whether a participant was treated with placebo, intensive lifestyle intervention or metformin. Jose C. Florez and Thomas J. Wang are joint senior authors. A complete list of members of the Diabetes Prevention Program Research Group is provided in the electronic supplementary material (ESM). The online version of this article (doi: 10.1007/s00125-014-3183-2) contains peer-reviewed but unedited supplementary material, which is available to authorised users. The investigators gratefully acknowledge the commitment and dedication of the participants of the DPP. The National Institute of Diabetes and Digestive and Kidney Diseases (NIDDK) of the National Institutes of Health (NIH) provided funding to the clinical centres and the coordinating centre for the design and conduct of the study, and for the collection, management, analysis and interpretation of the data. The Southwestern American Indian centres were supported directly by the NIDDK and the Indian Health Service. The General Clinical Research Center Program, National Center for Research Resources supported data collection at many of the clinical centres. Funding for data collection and participant support was also provided by the Office of Research on Minority Health, the National Institute of Child Health and Human Development, the National Institute on Aging, the Centers for Disease Control and Prevention, the Office of Research on Women’s Health, and the American Diabetes Association. Bristol-Myers Squibb and Parke-Davis provided medication. This research was also supported, in part, by the Intramural Research Program of the NIDDK. LifeScan, Health O Meter, Hoechst Marion Roussel, Merck-Medco Managed Care, Merck, Nike Sports Marketing, Slim Fast Foods and Quaker Oats donated materials, equipment or medicines for concomitant conditions. McKesson BioServices, Matthews Media Group and the Henry M. Jackson Foundation provided support services under subcontract with the coordinating centre. The opinions expressed are those of the investigators and do not necessarily reflect the views of the funding agencies. A complete list of centres, investigators and staff can be found in the ESM. GAW received support from NIH training grant DK007028, from the Scholars in Clinical Science Program of Harvard Catalyst—The Harvard Clinical and Translational Science Center (award no. UL1 RR 025758 and financial contributions from Harvard University and its affiliated academic healthcare centres), and the American Diabetes Association Merck Clinical and Translational Post-doctoral Fellowship. R01-HL-08675 (TJW) supported the natriuretic peptide measurements. JCF is supported by R01 DK072041 from NIDDK. TJW has received assay or research support from Diasorin, Singulex, Siemens, Brahms and Critical Diagnostics, as well as consulting fees or honoraria from Diasorin, Singulex and Roche Diagnostics. PJ has received Grant/Research Support from Abbott, AstraZeneca, Beckman Coulter, Daiichi Sankyo, GlaxoSmithKline, Merck, Roche Diagnostics, Takeda, and Waters Technologies and Salary/Consulting fees from T2 Biosystems and Quanterix. All other authors declare that they have no duality of interest in relation to the study. All authors made substantial contributions to the manuscript and gave final approval of the version to be published. GAW, YM, JCF and TJW conceived the design, interpreted the data, drafted and revised the manuscript. CAC, RBG, PJ, EH, KJM, EB-C and JD interpreted the data and reviewed and revised the article for critical content. GAW is responsible for the integrity of the work as a whole.